The Spanish Civil War is one of the most significant and tragic events in the history of the 20th century. In 2019, the world celebrates the 80th anniversary of the end of the Spanish conflict, which is often defined as the first battle of the Second World War and the “last battle of the romantics”. Events in Spain do not fit into clear schemes of confrontation for political or economic interests; first of all, it was a battle for ideals on Spanish soil, in which there was no room for concessions and compromises. The Soviet Union, one of the few who came to the aid of the defenders of the Spanish Republic, held a special place in this battle. Since then, the Spanish theme speaks in a special way in the hearts of our compatriots; it occupies an equally important place in the research of Russian Hispanic historians. Issues of international relations, Soviet military diplomatic assistance to the Republic, participation of Soviet volunteers and fighters of the Interbrigade, public diplomacy and cultural ties can be singled out among the most relevant issues of interest for researchers of the Spanish events of 1936—1939. Of particular interest are the documentary evidence of the Civil War of 1936—1939, which is stored in the Russian and Spanish archives, as well as the historical memory and problems of the interrelations of modern disputes and the events of 80 years ago. 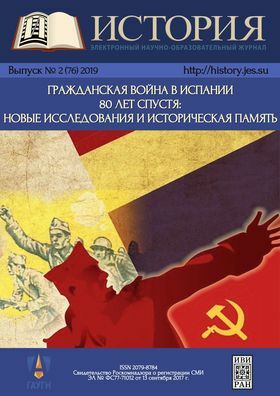 The materials of this issue were partly prepared on the basis of reports submitted by their authors during the work of the international scientific conference “Soviet-Spanish Relations during the Spanish Civil War of 1936—1939”, organized by the Institute of World History of Russian Academy of Sciences in September 2018. Articles are grouped into five sections. The first of them is titled “Soviet-Spanish interaction and Russian volunteers in Spain” and is dedicated to a multifaceted system of Russian-Soviet-Spanish intersections and contacts at the state, public and personal levels. Here are articles devoted to various areas of Soviet aid to the Spanish Republic, the formation of the image of the USSR in the republican and Franco press, the social and national composition of Soviet volunteers, the fate of Russian émigrés who participated in the Spanish Civil War on both sides of the front. The second section of the issue reflects the problems of international relations of 1936—1939. It touches upon the problems associated with the help the Francoists recieved from Hitler’s Germany and Portugal of Salazar, humanitarian aspects of the Spanish Civil War of 1936—1939, foreign policy perception of the Spanish conflict, the fate of the fighters of the international brigades, and the international context of the fall of the Spanish Republic. The third section of the issue is devoted to the reflection of the Spanish Civil War in the Russian archival collections. Here are overviews of documents of the Russian State Military Archives and the Foreign Policy Archives of the Ministry of Foreign Affairs of the Russian Federation, as well as new studies based on materials from the Russian State Archives of Social and Political Studies. A small but significant section of the issue is devoted to national issues in the context of the Spanish Civil War, presented in the Catalan and Andalusian material. The final section of the issue deals with the problems of historical memory. It consists of articles analyzing the discourses of the opposing sides, the refraction of the topics of the civil war in the Spanish cinema of the Franco era, the projections of the events of the 1930s on the left movement and modern Spanish internal political conflicts, as well as an idea of the Spanish events in the pages of the modern Russian press. The events of the Civil War in Spain of 1936—1939 were and remain one of the most important topics of historical research and form a significant part of the multifaceted Russian-Spanish dialogue. The compilers of the issue hope that its materials will help in highlighting the previously untouched problems and outline areas for further scientific research by both domestic and foreign researchers.